A security truck loaded with cash lays abandoned in a parking garage, and you only have seconds to cram as much cash as possible into your backpack before the cops arrive. Stray bills flutter behind you as you make a mad dash for the elevators. When you get to the roof a teammate jumps on the zip-line, but you choose a more direct route and swan-dive over the edge of the building. Your chute deploys. Bullets are whizzing far too close for comfort. The moment you hit the pavement it’s a straight-out sprint to the getaway van. Sirens are blaring. Cops are on the way. And that’s when you notice the massive crane crashing down. This is just a day in the life of the Battlefield Hardline player. Dramatic cops vs. criminals campaign. 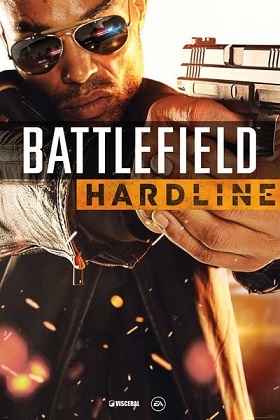 Crafted by the storytellers at Visceral, developers of the Dead Space trilogy, Hardline’s single-player story puts you in the shoes of detective Nick Mendoza in an episodic crime drama. Lead your crew and employ new tactics to gather intel, obtain warrants, and make non-lethal arrests.